(Nanowerk Spotlight) Bacterial propulsion systems are intriguing for nanotechnology researchers because nature has already solved most of the problems that they are still struggling with in designing molecular motors and other self-sustained nanoscale actuating systems. Indeed, it has turned out to be very challenging to even move sub-micron scale structures in well directed paths, especially under biologically friendly conditions. In previous work, researchers have already shown how large numbers of bacteria ("bacterial carpets") can propel larger sub-mm scale structures (see: "Live bacteria as mechanical actuators in fluid systems"). And in a 2005 paper, researchers from George M. Whitesides' group have demonstrated a method of using the power generated by biological motors to transport microscale loads while leaving these motors in intact cells ("Microoxen: Microorganisms to move microscale loads"). Scientists at Johns Hopkins University have now demonstrated a strategy to autonomously move nanostructures in well defined paths by enabling individual bacteria-cargo conjugates. 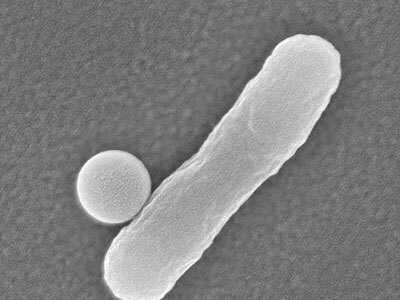 They showed how approximately 500 nm-sized structures deposited on substrates can be attached to individual bacteria and when released, the bacteria stay motile and ferry this cargo. "Our methodology for selective attachment and on-demand release of motile cargo-carrying E. coli bacteria from patterned substrates can be extended to electron-beam (e-beam) fabricated nanostructures with appropriate sacrificial layers for release," David Gracias tells Nanowerk. 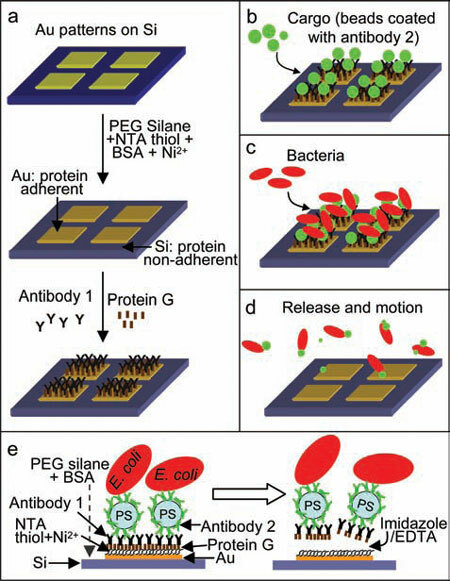 As the team describes in their paper in the February 2, 2011 online edition of Small ("Enabling Cargo-Carrying Bacteria via Surface Attachment and Triggered Release"), their methodology involves integrating fabrication, self-assembly, antibody-based attachment, and chemical release. "As compared to previous methods for attachment of cargo to bacteria – primarily blotting based – we conjugate the bacteria to the cargo at a patterned silicon substrate using the specificity of antibody-based interactions," explains Gracias. "This approach is motivated by the fact that many micro- and nanostructures are fabricated using lithographic approaches that facilitate their creation on silicon substrates. Moreover, at the nanometer scale it is often necessary to fabricate the structures using e-beam lithography, which is a serial process yielding only small numbers of structures." If these structures are released from the surface prior to attachment to bacteria, as is required in solution-based attachment schemes, the small concentrations of fabricated structures relative to the bacteria make the probability of attachment and subsequent tracking challenging. "In principle" says Gracias, "it may also be easier to geometrically orient the cargo relative to the bacterium at a surface as compared to in solution. Additionally, surface attachment provides control with respect to when and where the cargo-carrying bacteria could be released." For their approach, the team developed a two-antibody-based method to attach and release motile cargo-carrying bacteria from patterned surfaces. Gracias explains that antibody-based attachment facilitates selectivity for a particular bacterial species as well as specific locations (receptors) on the bacterium. "Our surface attachment methodology enables surfaces to be coated with bacteria-cargo conjugates, which can be released on-demand and in response to specific chemical triggers." One aspect that makes bacterial propulsion system so interesting for nanotechnology researchers is that bacteria are exquisitely sensitive to a wide variety of external stimuli. For instance, many microorganisms are chemo-tactic i.e. they can sense chemical gradients and move in specific directions. For example, in another recent paper, Gracias' group has shown how chemical patterns can be used to self-organize bacteria into a helix ("Three-Dimensional Chemical Patterns for Cellular Self-Organization"). "By attaching cargo to individual bacteria, we can essentially move and organize nanoscale cargo autonomously in 3D" says Gracias. "Ultimately it is envisioned that these bacteria can also be utilized to pick and drop-off cargo so that they can deliver therapeutics to specific regions in the body. Microbes also thrive in a variety of environments so it is conceivable that sensors and actuators can be attached to bacteria to explore for example the oceans." The motivation for this work is the creation of autonomous miniaturized smart devices. "The biotic and abiotic world often have contrasting capabilities" says Gracias. "Microbes can move on their own and genetic manipulation offers the possibility for smart behaviors. Abiotic micro and nanostructures can enable electrical and mechanical functionality for sensing and actuation. Our hypothesis is that by linking components from each world together, we can enable dramatically new functionalities in nanotechnology." Going forward, there are several challenges. The team utilized cargo in the shape of 400-600 nm spheres; they would like to extend this approach to include more complex and functional cargo such as nanogrippers or sensors. "We are also investigating methods to increase the yield of attachment and collaborating with other investigators to utilize genetically modified microorganisms that may provide phototactic, magnetotactic and specific chemotactic behaviors" Gracias describes his planned work.